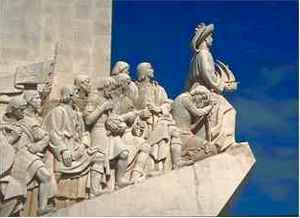 ABOVE: Monument to the Explorers, Lisbon. Lisbon has been one of my favorite cities since 1952, when I spent a summer in neighboring Estoril. The Portuguese capital has changed over the years, and a building boom has contributed to urban sprawl since Portugal joined the European Union in 1986. Modern buildings tucked into downtown streets can be jarring to travelers who remember Lisbon in the days when the city was crumbling but prettier. Still, in the words of Lonely Planet Portugal, "Add today's cultural diversity together with a laid-back ambience and an architectural time-warp, and you have one of Europe's most enjoyable cities." The physical setting alone makes Lisbon an appealing destination. The city is built on hills overlooking the Tagus River (Tejos in Portuguese) where the river meets the Atlantic Ocean. The climate is benign--like San Diego's, but less dry--and the older parts of the city are rich with murals of azulejo tiles, art nouveau buildings, sidewalks paved with decorative patterns of tiny black and white stones, public staircases leading steeply upward through ancient neighborhoods, double-decker buses, and funicular tramways where you may see a cat hop aboard and get off at the next stop. Museums and monuments are other popular attractions. No visit is complete without a tour of the Jer�nimos monastery, where ropes and other maritime themes are carved into stone. Take time to explore the Moorish Castelo de S�o Jorge, which looks like a fortress on the outside but is a delightful place of gardens, towers with scenic views, ponds with swans and peacocks, and other attractions within its walls. Don't miss the Torre de Bel�m, and spend an hour or two at nearby museums like the Museo Nacional des Coches (coaches worthy of Cinderella), the Museo de Marinha (boats and naval exhibits), and the Museo de Arte Popular (folk arts, exhibited by region, and a "must see" warm-up for shoppers interested in handicrafts). Finally, two newer attractions--the stunning Museu do Oriente and the world-class Ocean�rio de Lisboa in the modern Parque das Nac�es--are also worth visiting if you're in Lisbon for more than two or three days. The sounds of Lisbon are as distinctive as its sights and scenery. You'll hear the rumble of cable-drawn ascensores rounding tight corners on steep hills, the trilling of canaries in cages hanging outside the windows of apartments, the flapping of sheets on overhead clotheslines, the screech of seagulls along the waterfront, and the haunting songs of fado singers in smoky nightclubs. If you arrive during the warmer months, you can hop aboard a train to suburban coastal resorts like Estoril and Cascais for a day of swimming and sunbathing. For another change of pace, take the commuter train to nearby Sintra and its two national palaces. Ready to go farther afield? No town in Portugal is more than a two-day drive from Lisbon, although I suggest allowing at least a week for the North or South if you're touring by car. Better yet, spend up to two weeks in either part of the country and save the other half for a later trip. Portugal is a country to be savored, not rushed. Portugal is more welcoming to children than any other country I've lived in or visited (including Spain and Italy, which tie for second place). Don't be surprised if your smaller children are patted on the head by strangers of both sexes or fawned over by children just a few years older. This is the Portuguese way, and the stranger who tells your little girl that she's pretty or offers candy to your son is unlikely to be a pervert. Best of all, Lisbon is a great value. It isn't cheap, the way it was 20 or 30 years ago, but you'll get more for youe money in Portugal than in other major countries of Western Europe. Please click on the links in the navigation table below for annotated Web links and travel advice on hotels, food and drink, museums, shopping, transportation, and other topics.